For cities that breathe, we are committed to reducing our environmental footprint. The first multimodal operator in the world to be ISO 50001 certified, we have ambitious commitments to reduce our energy consumption by 20% within 10 years (2015/2025) through actions such as our 2025 Bus Plan, which aims to have by 2025 in Paris and Île-de-France a bus fleet that is electric, bio-NGV, hybrid. We are exploring new solutions to save energy and resources: heat pumps to heat and cool the air in the equipment rooms in the new metro station Front Populaire (line 12), maintenance sites for trams with very low energy consumption, or geothermal energy to heat and cool two future line 14 stations (Porte de Clichy and Mairie de Saint-Ouen) while covering 40% of the heating needs of a building with 80 apartments for Mairie de Saint Ouen station. As a committed participant in the energy transition, we test and deploy innovative systems that combine new technologies (electric propulsion, big data, smart grids, etc.) and new uses (the sharing economy, new forms of mobility, etc.). Let the city breathe, give greenery its rightful place, relieve congestion in dense neighbourhoods. 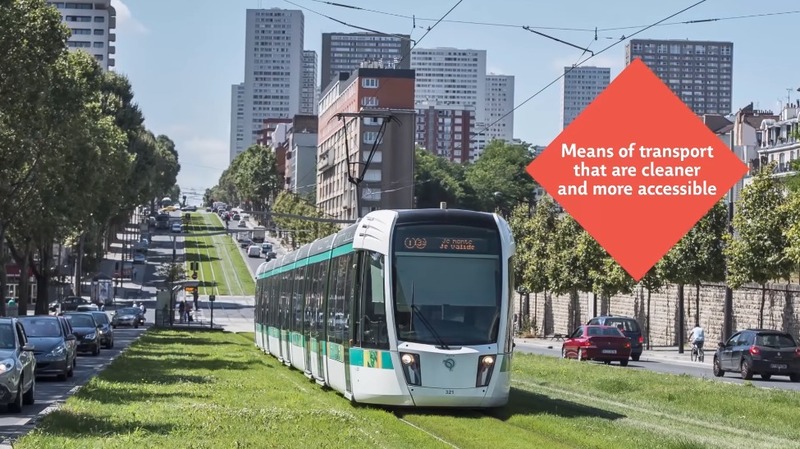 With cleaner transport solutions and a detailed approach to new challenges such as space optimisation and densification, social diversity and integration, or urban agriculture, the RATP group is ready to meet its customers’ new expectations, to achieve long-term development of territories and employment.